In second grade we've been designing postage stamps. You can make postage stamps about practically anything. It's kind of an alternative to "make a poster about." So this type of project is really easy to fit into any kind of core curriculum. First we looked at lots of stamps and found some common traits. (price, USA and the year it was printed) Then we talked about scale: how we would design our stamps large then eventually shrink them down on the computer and print them small. Next we talked about the idea of artistic process. 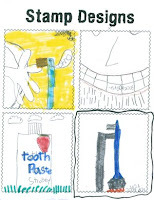 We came up with a message (Our stamps would help raise awareness about dental health.) Next we brainstormed. We filled the white board with many many ideas of how we could convey our message. 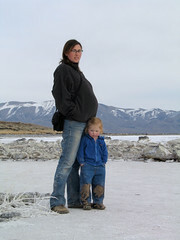 After that I had the kids choose four ideas to try out. I loved this step because these seven and eight year olds had no problem coming up with several very different ideas. Some even asked if they could design more than four. When I ask my fifth graders to try out four or five ideas, they come back to me with four or five sketches that look almost identical to each other. I have to challenge them to find the "other good ideas" that are in their heads. Anyway, after they tried out four ideas, I had them consult with each other to determine which of their ideas best conveyed their message. Finally we made our final paintings (which were 9" X 10"). The kids used watercolors for this. 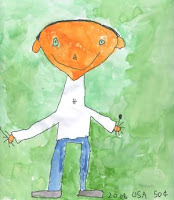 I have to say that second graders these days can watercolor WAY better than I could when I was seven years old. They really astounded me. I had the kids mount their pictures on a background of white paper with a wavy edge, to simulate a real stamp. Then I scanned their images and put them all together as a sheet of stamps. I have one sheet for each class. This was a fun project and I loved seeing how the kids really worked to communicate their message. One class used the same process (decide on a message, brainstorm, try out four ideas, then make a final drawing) with their classroom teacher to make Arbor Day posters. Their results were marvelous and they all had such great, unique ideas. I love how you can teach so many different ideas through visual art. It's almost like hiding vegetables in "yummy" food. awesome. keep the lesson plans coming.